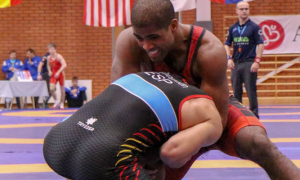 If there is one thing that the Junior Greco World Duals require, it is perseverance. Wrestlers don’t just show up to Concord, California, weigh in, and hop into a bracket. No, there is bit more commitment involved than that. Before any individual glory is attained, athletes are called upon to duke it out in up to seven dual meets. That’s the minimum. And when that’s over, then the tournament comes into play. You win, advance, win, advance. By the time the weekend is over, there can be as many as ten matches under your belt should you prove successful. It isn’t easy. It isn’t supposed to be. Mark Halvorson, the head coach of the Community Youth Center and the event’s director, understands the balance necessary for athletes to survive what the Junior Greco World Duals have to offer. Just because a wrestler starts slow, there is time to get back on track, primarily because there are so many chances to. “One of my kids was 3-4 at the Duals and he came back today, beats a couple guys, and made the finals,” Halvorson said. Along with Omania, another 2016 Cadet World Team member had himself a nice showing over the weekend — Kansas’ Clay Lautt (79 kg). “He actually wrestled a really tough kid from Chechnya who lives in Sweden,” Halvorson explained. “He was really tough and Clay got two good matches against that kid.” Lautt wound up finishing up second on Sunday. One of the country’s most active age-group athletes is Hunter Lewis (49 kg) though in this event, he wrestled for the Scandinavian team that was made up of athletes from various countries. Lewis earned a bronze at the Malar Cupen in Sweden back in November and recently returned home from a trip to Finland. 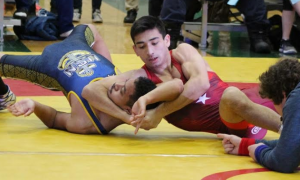 He wanted more international experience and got his wish this weekend, piling on win after win to break all the way through with a gold over CYC’s Cole Greggerson in the finals. Listen to “5PM03: Joe Betterman joins the show to talk about life and the World Team Trials” on Spreaker.